WASHINGTON: Donald Trump´s billionaire commerce secretary fueled accusations Thursday that the US administration was deaf to the impact of the government shutdown after saying he didn´t understand why some federal workers were turning to food banks. Wilbur Ross shrugged off the impact of the shutdown -- now in its 34th day -- saying workers should just take out loans to cover their expenses. Asked by CNBC television whether he was aware that some federal workers were getting food from homeless shelters, Ross said: "Well I know they are and I don´t really quite understand why." Noting that the 800,000 federal workers currently working without pay will eventually receive their paychecks, Ross said "there´s no real reason why they shouldn´t be able to get a loan against it. "The idea that it´s paycheck or zero is not a really valid idea," he said, while adding that he did feel "sorry for the individuals that have hardship cases." Ross´ comments were ridiculed by Democratic House Speaker Nancy Pelosi, who is refusing to authorize the $5.7 billion in funding Trump wants to build a wall on the border with Mexico. "They just don´t understand what it means to live paycheck to paycheck," Pelosi said. 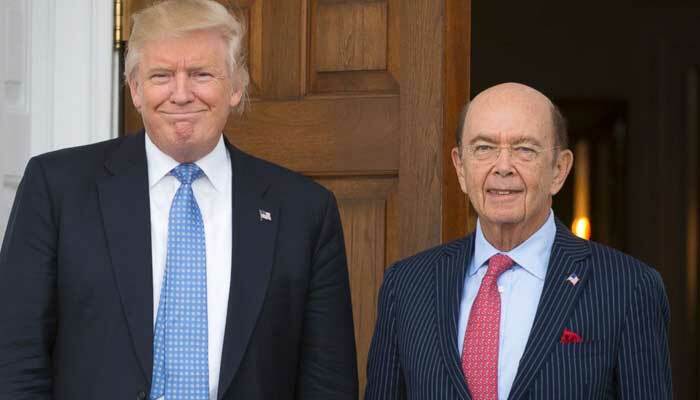 "They have Wilbur Ross saying he doesn´t understand why when he was asked about people going to food lines and pantries," she told reporters. "I don´t know, is this the ´Let them eat cake´ kind of attitude," she said. "Or ´Call your father for money.´"
Senator Chuck Schumer, leader of the Democratic minority in the Senate, also lashed out at Ross, saying his comments "reveal the administration´s callous indifference towards the federal workers it is treating as pawns." "Secretary Ross, they just can´t call their stockbroker and ask them to sell some of their shares," he said. "They need that paycheck." It wasn´t just Democrats criticizing the commerce secretary´s remarks. "I don´t think comments like that help," said Republican Senator Mitt Romney of Utah. Asked about Ross´ remarks, Trump said his commerce secretary has done a "great job" but "perhaps he should have said it differently." Trump said his message for federal employees working without pay was "I love them. I respect them. I really appreciate the great job they are doing. "Many of those people that are not getting paid are totally in favor of what we are doing because they know the future of this country is dependent on having a strong border," he said. Kevin Hassett, chairman of the White House´s Council of Economic Advisers, came under fire after suggesting on PBS Newshour earlier this month that federal workers were essentially getting free vacation. "A huge share of government workers were going to take vacation days, say between Christmas and New Year´s," Hassett said. "And then we have a shutdown, and so they can´t go to work," he said. "So then they have the vacation, but they don´t have to use their vacation days. "And then they come back, and they get their back pay," he said. "Then in some sense they´re better off." Democratic Senator Mark Warner of Virginia said Thursday that Trump and other top administration officials have shown a lack of "common decency" by failing to sit down with struggling federal workers. "The truth is I´ve never seen a president with so little empathy," Warner said.